These questions are about the process of transferring to Chapman. We also have a general Frequently Asked Questions for Undergraduates page. If you can not find the answer to your question, please contact us at transfers@chapman.edu or (714) 997-6711. + - When is it possible to transfer to Chapman University? 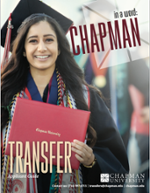 Chapman accepts transfer students for both the fall and spring semesters. Please check the transfer student section for specifics regarding units, general education, and steps for transferring. Keep in mind certain majors are a better fit for a fall entry vs. a spring semester entry. When you are are ready to apply, use our How to Apply for transfer students page for step-by-step instructions. + - Am I a first-year or transfer applicant to Chapman? You have not yet received your high school diploma or the equivalent and are enrolled in an early-college program or dual-enrollment program. You have started your college enrollment (Must be AFTER you HS graduation date or equivalent) at a regionally accredited college or university. Regardless if your college units are in progress or you have some that are completed, you would apply as a transfer student. + - If I plan on transferring to Chapman, how do I know which college courses I've taken will transfer? You can use Transferology to see if your courses will transfer. After creating an account, this free tool allows you to enter courses you have taken (or plan to take) and see which will transfer into a degree program at Chapman. We also encourage all prospective transfer students to schedule an advising appointment (in-person or over the phone) so we can assist you with course articulation questions and establishing a timeline of when to apply. You can make an appointment by calling us at (714) 997-6711. + - When is registration? If you enter in the fall semester, you will be assigned a registration date in June for mid-July registration. If you start in the spring semester, you will be assigned a registration date in mid-December for mid-January registration. + - Is advising mandatory? Yes, all incoming students are required to work with the Academic Advising Center prior to registering for classes. Incoming transfer students will have an advising hold on their account until they complete their advising requirements. For more information, refer to the Academic Advising Center page for New Transfer Students. + - When is transfer student orientation? Is it mandatory? Fall orientation for transfer students happens at the end of August. Spring orientation for transfer students happens in the end of January. The only orientation programming that is required for incoming students is our Healthy Panther Initiative. Additional opportunities to complete the program will be offered if you are unable to attend during Orientation week. The purpose of Orientation is to build community and offer opportunities for you to become acclimated to Chapman. We encourage you to attend. You can learn more about New Student and Family Orientation here. + - Will I get on-campus housing? We are unable to guarantee on-campus housing for all students, but our Residence Life and First Year Experience office reserves a portion of housing for incoming transfer students. If you are entering in the fall and interested in living on campus, you should submit your Chapman Housing Application by May 15 for priority processing. More information regarding the housing process for transfers can be found on our Transfer Checklist in May. If you are entering in the spring, you should contact Residence Life and First Year Experience directly. + - Are there information sessions specifically for transfer students? Yes. We offer Transfer Information Sessions that cover the application and admission process for those transferring from 2- or 4-year institutions. For a schedule of our session, or to register, visit our Transfer Information Session page. We also offer individual transfer appointments in person or by phone. To schedule a transfer appointment, call (714) 997-6711. The purpose of both the Transfer Information Session and transfer appointment is to prepare students for the application process. They are intended for students who are one semester to a year away from applying to Chapman. + - What courses are required to complete before applying? At a minimum, transfer students should complete a transferable college-level English and math course prior to their first semester at Chapman. If you are applying to a school/college not listed above, your major does not have any prerequisites. + - What resources are there for me on campus as a Transfer student? + - Do you accept IGETC or CSU certifications? Yes, we accept both and there is no preference between either. We will honor the completion of the full certification through IGETC and/or CSU all the way up until you start classes at Chapman so students can be in progress with it when they apply. + - What are the application deadlines? Our deadlines for admission are February 15 for fall admission and October 15 for spring admission. Applications are considered on a space-available basis after the deadlines. Some programs are better suited for a fall start. That list can be found in our Transfer Applicant Guide. + - What are required documents to apply? Please review our How to Apply page for transfer students for the most up-to-date requirements. + - What is the cost of attendance? You can view current figures for cost of attendance here. Transfer students are considered for merit aid/scholarships by submitting their application for admission. We also encourage you to fill out the FAFSA so we can consider you for need-based financial aid.